Discussion in 'Ride Reports - Day Trippin'' started by carlaking, Feb 4, 2019. 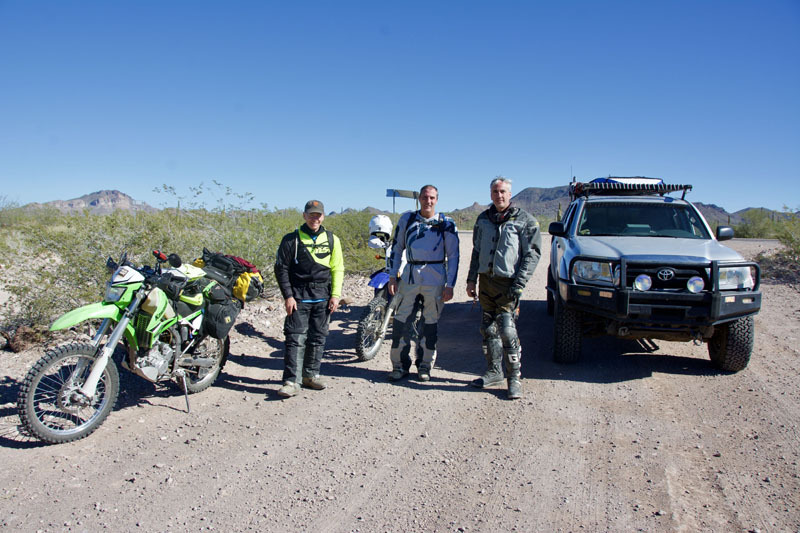 I left the KLR 650 and the KTM 450 EXC in the garage and took the Tacoma to scout a ride from Mulege to Scorpion Bay on off-road routes. Okay, so I also wanted to surf. I strapped my paddleboard to the roof rack and threw some basic camping gear into the Tacoma. The trip was awesome and there are routes for enduros and big adventure bikes. Now I just have to figure out how to rig a rack on the Tacoma to carry the KTM safely in this rough terrain. Suggestions welcome! I set out at 9:45 on MEX 1 to the kilometer 61 turnoff to La Purísima. A group of four motorcyclists were stopped at the side of the road so I asked if they needed help as I have a compressor in the truck. 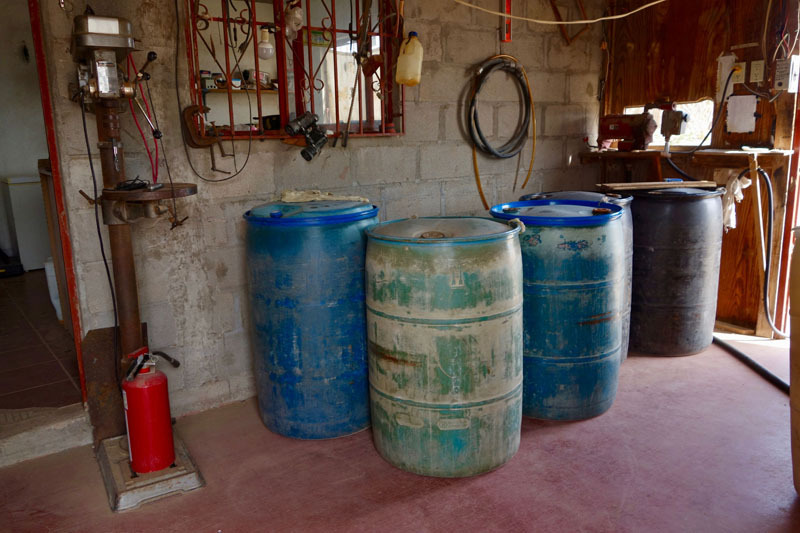 One guy was just finishing a minor tire repair so the others and I spent a few minutes chatting about their bikes, all under 500 ccs, and their route, which was also San Juanico, with San Ignacio on the menu for the following day. Eric and friends trailer bikes from the SF Bay Area to ride the Baja every year. Leaving them behind, but keeping an eye out for them in my mirrors, I went on ahead. I was happily surprised by the quality of the road, wide with packed dirt and rock. The Tacoma rolled along unchallenged at about 40 mph. 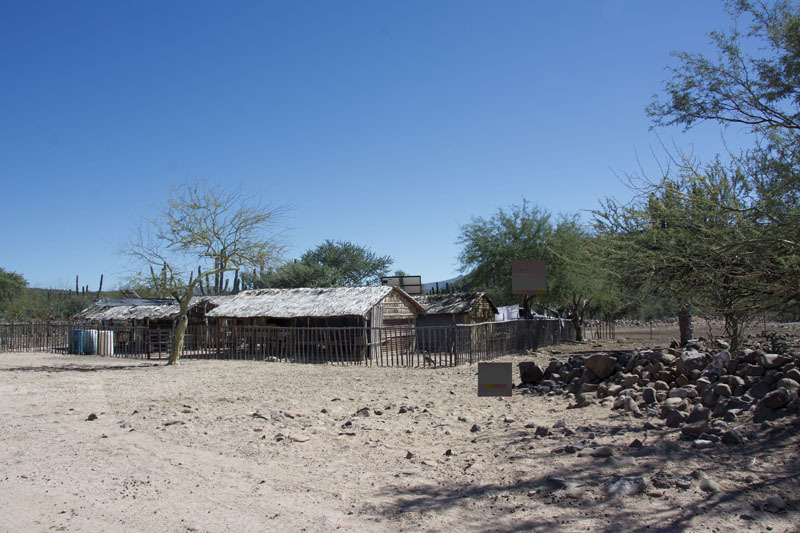 The landscape is typical Baja desert with mesquite and other chaparral, cholla cacti, elephant trees, agave, pitaya, palo verde, and cardón cacti, the saguaro’s giant cousin. It's fairly level with some roller coaster hills but no real ascents or descents until the descent into San Isidro an hour down the road. The route to La Purísima, where the road is wide and the vados are shallow. I met the first in a series of inevitable vados a few miles in. The fourth or fifth vado was a narrow squeeze, barely as wide as the Tacoma. A concrete apron that once smoothed the crossing sat crookedly atop the stones creating even more of an obstacle. Up until now any 2WD vehicles could have passed. But this one was steep on both sides and cluttered with loose rocks. No problem for a 4WD or the small bikes but a big adventure biker would need to take a bit of care. Spotting the headlights of Eric and company behind me, I pulled to a stop. As an off-road motorcyclist myself, I know it can be intimidating to pass a moving vehicle, even when it seems like there’s plenty of room. But with everybody bouncing around and kicking up dust, any little thing can cause you to go down, and the thought of bouncing off a truck is not fun. I spent a pleasant hour toodling along at between 20 and 40km/hr, windows open with a cool breeze on my face. 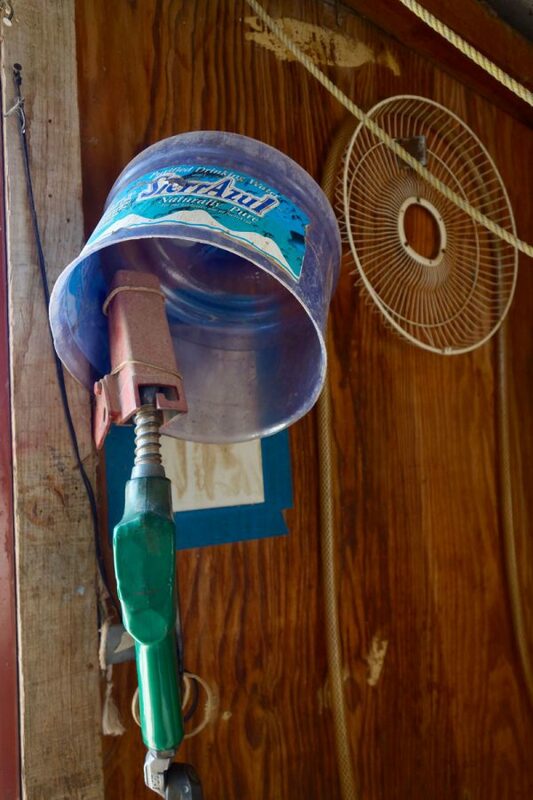 There are several ranchitas along the way at spots with water sources. 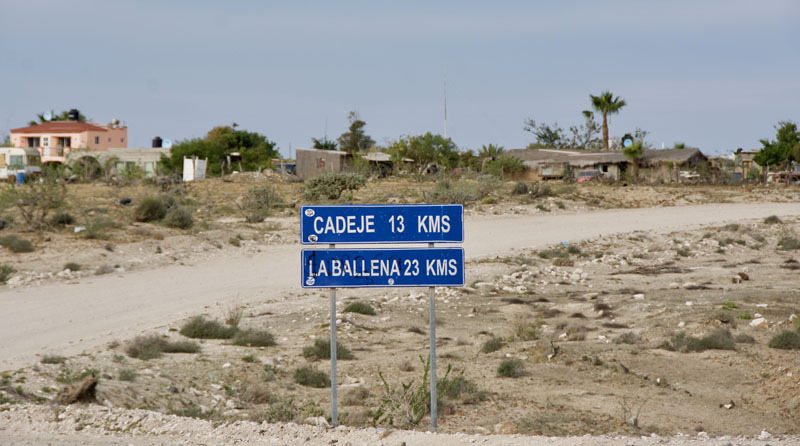 Most of the ranchitas are marked formally with road signs. 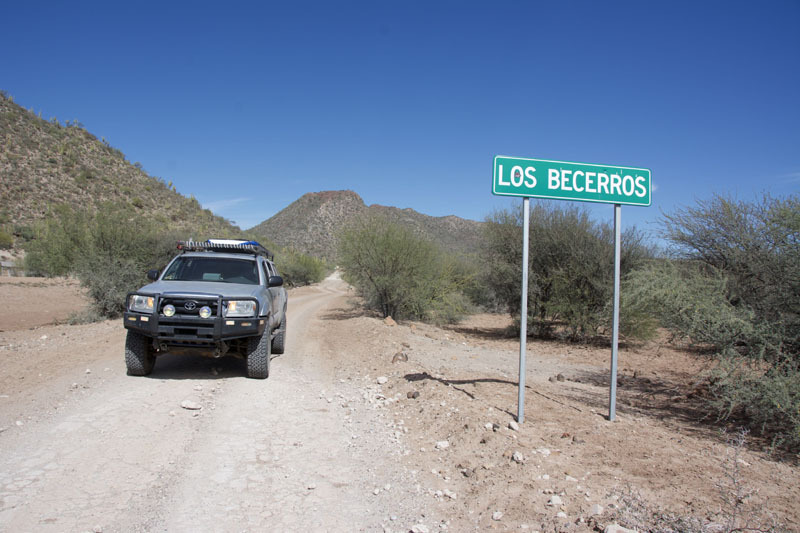 Ranchita Los Becerros is especially well marked. 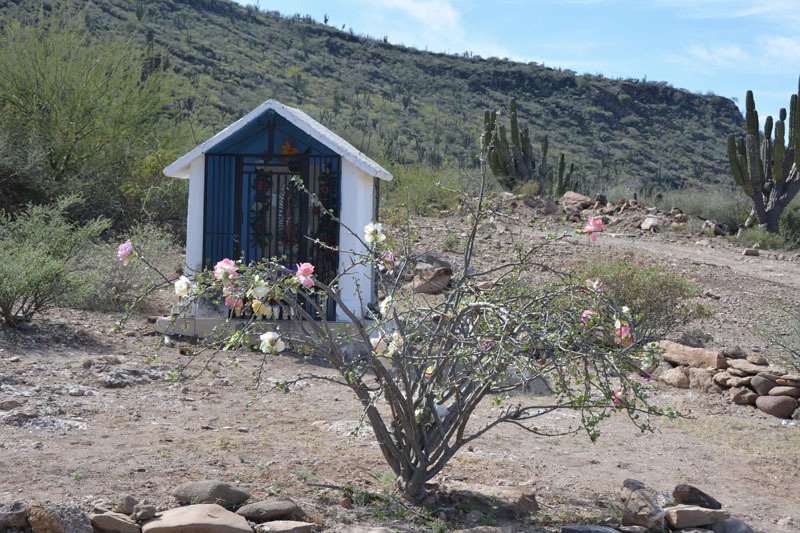 This abandoned ranchita is marked with a shrine and a bush strewn with plastic flowers. I’d been driving about an hour when the road poured me into the valley at San Isidro, a refreshing blue and green surprise with a fun set of switchbacks. 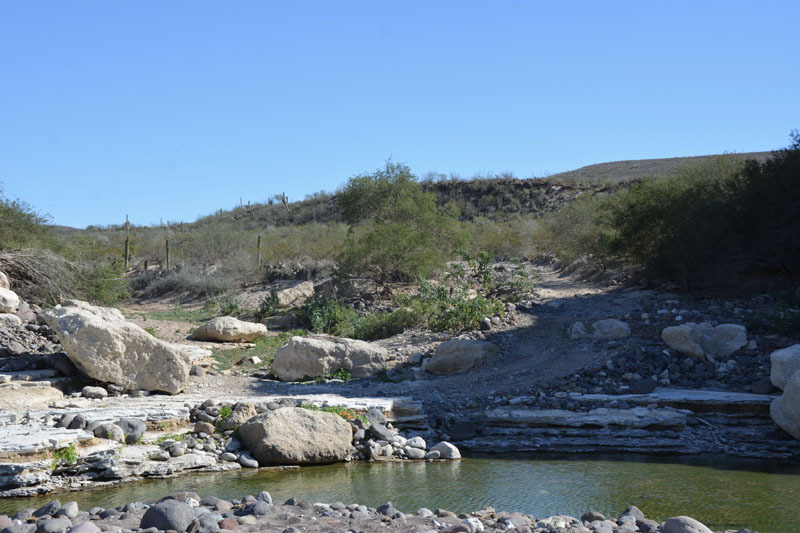 Water is everywhere and the landscape is lush with date palms and farms and Cerro "El Pilón,” its domed mountaintop. San Isidro melts into La Purísima with more water and lush greenery and then there is this sign. I turned in and this is where it started to get interesting. Up until now I would definitely recommend this route to big adventure bike riders. In fact, it's an easy introduction to dirt for any size dual-sport. Personally, I’d have no problem riding it on my KLR 650 and you GS ADV riders please go ahead. But I would not recommend big bikes attempt this next stretch. Sure, take some photos doing this water crossing but turn back and take the highway to San Juanico. I didn't see anything bigger than a KTM 500 in the next two hours and I didn't wonder why. It would simply be too much work and frankly, dangerous. The water crossing was no problem as it's very shallow but it was immediately followed by a steep hill skittery with big loose rocks. On my way up I saw that a couple of motorcyclists had heard me coming and pulled off because the road narrows and they knew there was no way I could safely stop on the steep uphill once I got going. Thank you very much. Personally, downhill on loose rock is my biggest challenge when I'm off-road motorcycling and I took note of conditions for my KTM 450 trip. Once up that hill, the road leveled out though it could get narrow in spots. It was much rockier than the road to La Purísima and had a few spots that slowed me down to a crawl. The road climbed and for long moments I could see the Pacific. Strangely, all the motorcyclists were heading south. Each time I heard them I'd pull over and stop. The fact that nobody was overtaking me gave me pause. Why was everyone coming from San Juanico to La Purisma and nobody going the other direction? I wondered if there was an obstacle ahead that even the bikes couldn't navigate. After a while, I recognized my mind looping on the useless low-grade worry and told myself to stop. I was an hour in when I faced a water crossing and wondered if this would be where I'd have to turn back. Walking the break, I saw two ways to cross. The first was a ledge on the far right that the motorcyclists definitely used but that was just barely too wide for the Tacoma. The only other option was to skinny through the boulders, drive down into the water, and bump up the other side. The problem was the old concrete foundation had broken and was jutting slightly up over the natural ramp. I measured the height of it with my arm against the height of the tire and it came to just below the middle. I figured if I couldn't make it, I could back up (with some difficulty without a spotter) the way I came and turn around. 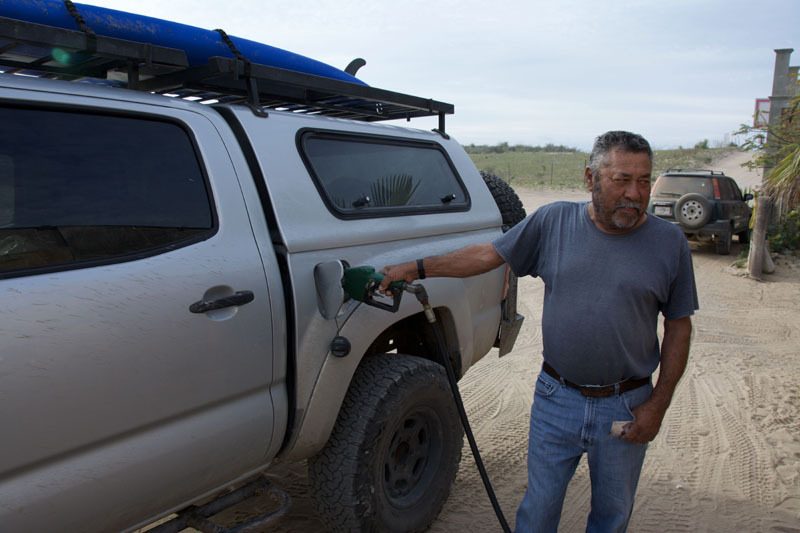 I got back into the Tacoma, took a deep breath and inched down. 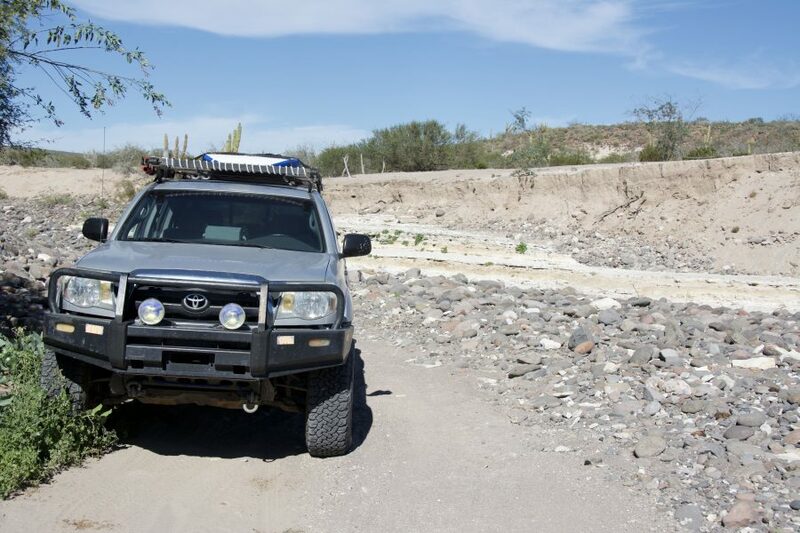 The Tacoma barely squeezed through the boulders and I had to rock it to make the sharp right turn into the water. At the ramp I held my breath and bounced it up, elated when it caught and crawled right up without complaint. 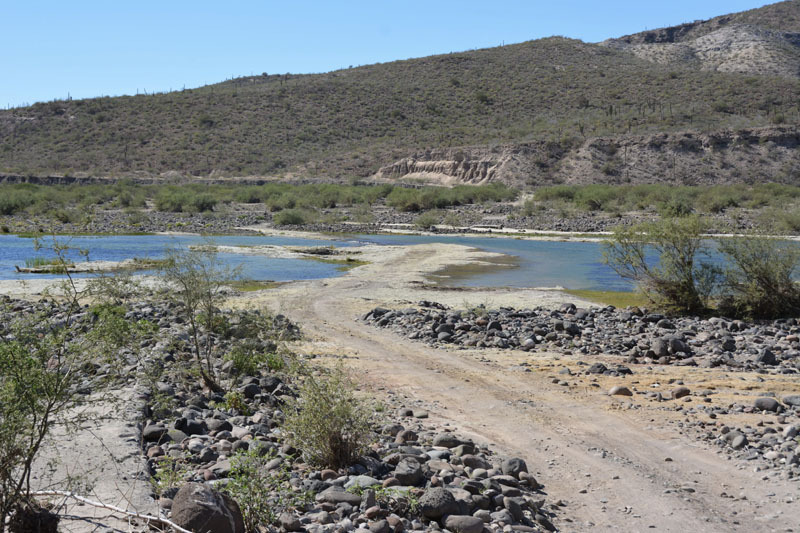 On the north side of the water crossing on the San Juanico East Road. I think this might be at Los Burros. As I was an hour into this road, I hoped there wouldn't be any obstacles worse than this. But after a little climbing, the road was wide, sandy, with a gentle roller-coaster configuration. If you're not comfortable on sand you're not going to like it but if you want to learn it's a nice wide road to start on. 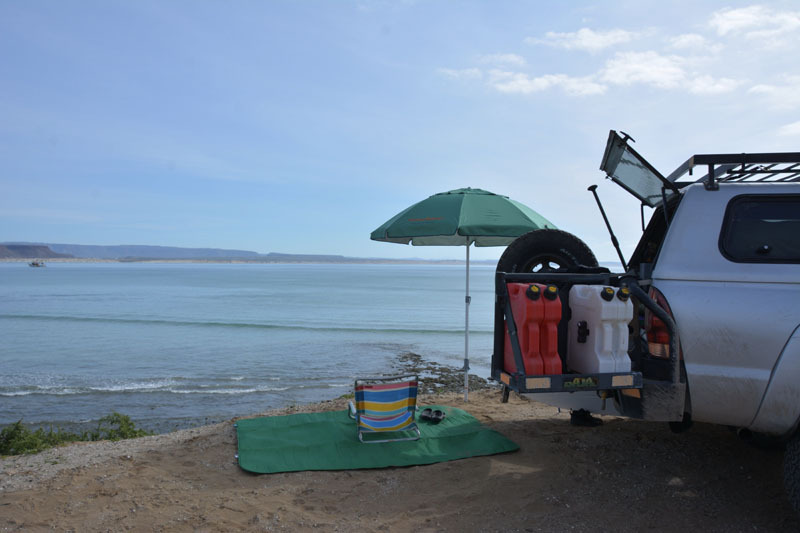 It's also close enough to San Juanico that you can camp and come do it without your bike loaded up. A gentle wind had softened any tire tracks but clearly there had been no motorcycles passing by recently. A few unmarked roads turned off toward the coast and I wondered if they would dead end at ranchitas. The atlas, now outdated, showed about 35 miles between La Purisma and Scorpion Bay but I'd been so focused on driving I forgot to make a note of the mileage. I drove so long that I wondered if I'd somehow bypassed Scorpion Bay entirely and was on my way to San Ignacio. Finally, I talked myself into turning around to take one of the west roads I'd passed by to see if I could at least spot the shape of the bay to the north or south. About 60 seconds later I saw a vehicle coming toward me and waved it down. Gringos! We were all feeling like this couldn't be the main road into Scorpion Bay and they confirmed that they'd gone beyond the number of miles on the map. However, they had an iPhone and a GPS that insisted it was north. 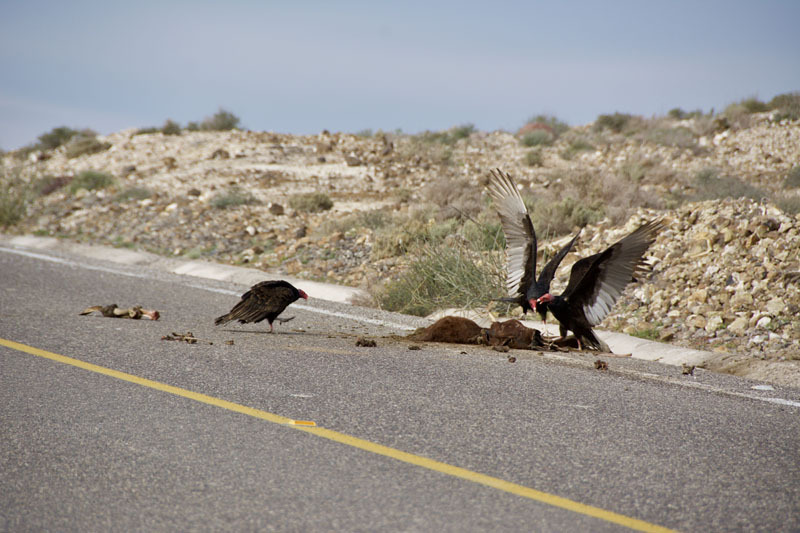 So I turned around to follow them and we continued on the wide sandy road to be abruptly spit onto a beautifully paved black-top highway with a yellow line down the middle and everything. I took it out of 4WD and breathed a sigh of relief as I skirted a marshy estuary and suddenly there was beach, beach, and more beach. Wide, white, beautiful beaches. I turned off to park and get some sand on my toes and met Bill, a local who gave me the lay of the land. He pointed me to the bluffs and that's where I headed. 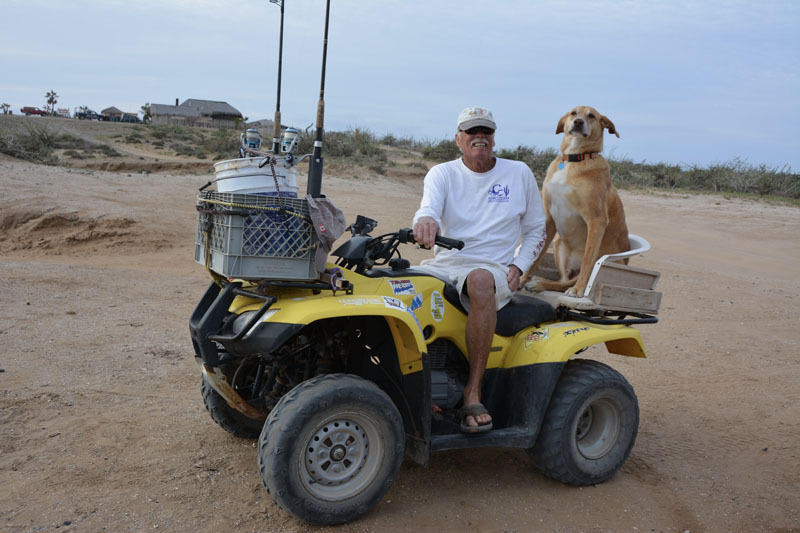 I'd meet Bill and his dog Gus several more times in the next couple of days. Without exploring "town," I parked on a bluff and set down roots for my stay. I didn't even set up my tent, just slept in the back of the truck. There were two guys in van conversions with surfboards and KTMs. Awesome. 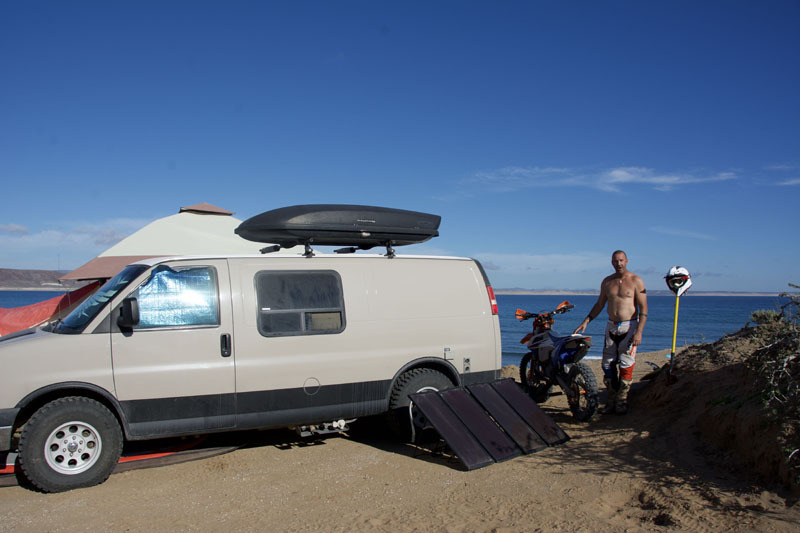 David has a great setup for surfing and motorcycling. Eric rode up the next morning to say they were all headed to San Ignacio and he'd let me know how the roads were. 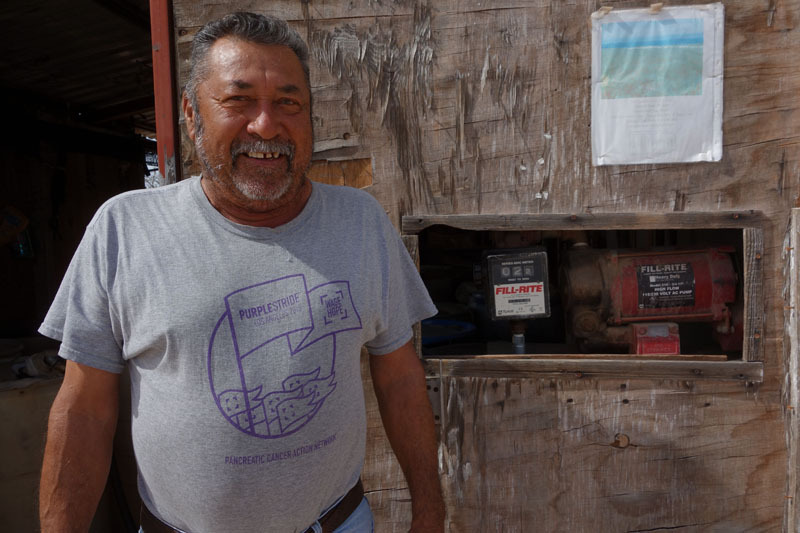 True to his word, he emailed to say that the road out of San Juanico to San Ignacio was good. His group turned off to the low road through el Datil. They crossed the valley to the high road at El Buro and took a road to el Patrocino. He said it was a fun two-track last year but now it’s wide and smooth enough for a passenger car. Before heading out, I put in 500 pesos of gas (at 22p/liter) at Pancho's station. I'd decided to slab it all the way back to Posada via Insurgentes and Loreto to see what those roads were like. The gas meter, zeroed out. Though the highway encourages high speeds it's not a good idea. 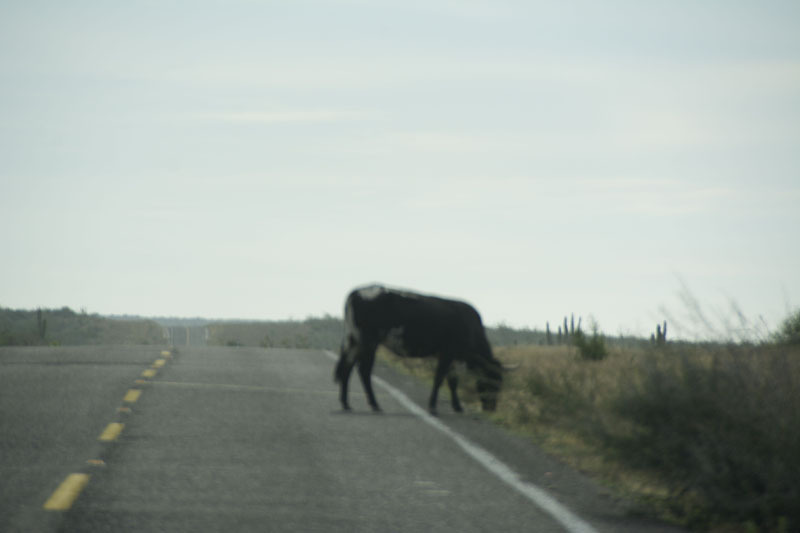 There's simply too much livestock in the road. In one hour I was forced to stop many times for cattle, horses, goats, and even a deer. If an oncoming vehicle flashes their emergency lights or headlights at you they're warning you to slow down. Goats can be especially hard to see. Very comfortable on the road, and loathe to move. The deer appeared east of Insurgentes. It was the second I'd ever seen on the Baja roads. The first was in the mountains between San Ignacio and Santa Rosalia when I was riding my KLR down a couple of years ago. This deer had been grazing at least 200 feet off the highway when I spotted it. It heard the truck, panicked, and instead of running away from the road it ran right in front of me. Luckily, I anticipated that and had slowed almost to a stop. Best practice: When you see a deer, just stop. 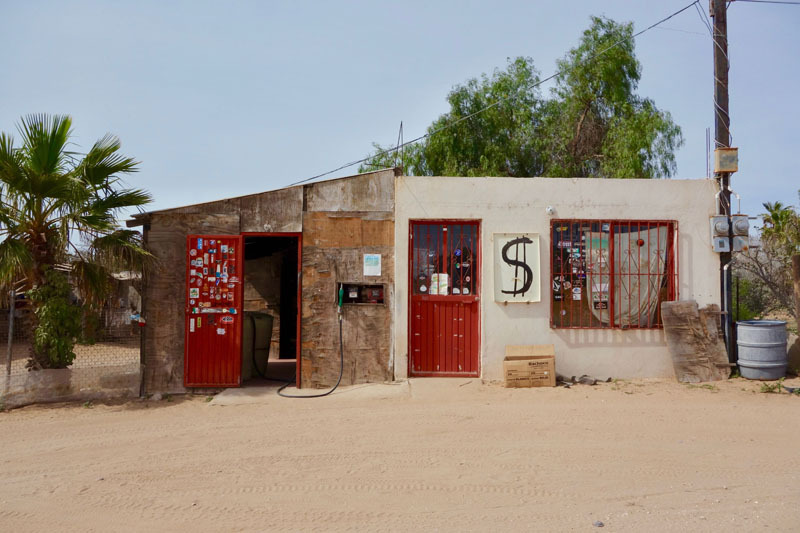 The next gas station turned out to be fewer than 80 miles away in a little town just north of Insurgentes which boasts two Pemex stations and a Super Ley grocery store. Some of the campers told me this is the best place to stock up on supplies before heading to San Juanico if you're coming from the south. The highway was an hour of boring until the Sierra Giganta loomed. Then it became nice and twisty, though remaining well-paved and safe except for some rock fall and a few gringo bicyclists in neon spandex. I passed by all the Loreto resorts and the town itself. At the checkpoint 30 miles north of town I was behind three riders on GSs who were waved through. I was detained for about five minutes for inspection. The soldiers asked where I'd been and where I was going. They thoroughly searched the front of the truck but didn't bother opening the camper shell. In an hour, I was back home in Posada. My trip from Posada (20 minutes south of Mulegé) to San Juanico took me just under five hours each way. The route from km 61 all the say through La Purísima to San Juanico off-road was 100 miles one way. I took my time and stopped to take photos and notes. I could have probably shaved off an hour by getting on the highway at La Purísima. The route home, all on highway, was 210 miles one way. So about twice as far but the same amount of travel time though I only stopped for gas once. 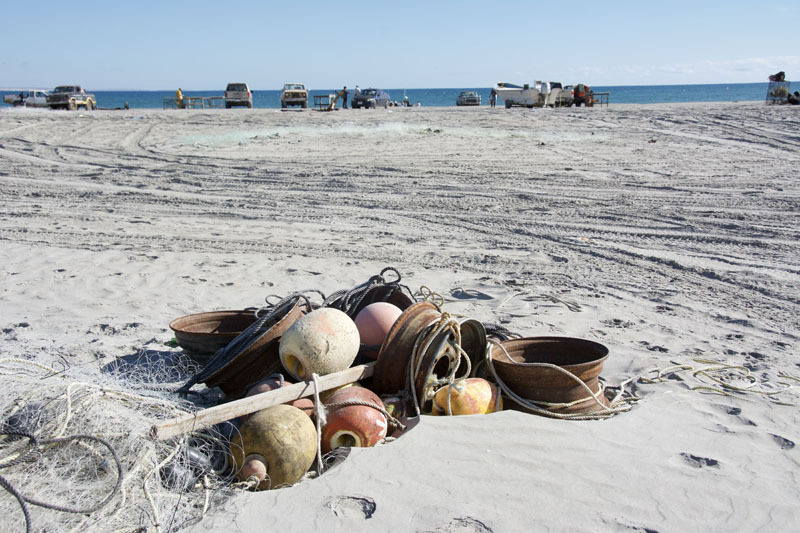 For updated information including a description of the route from San Ignacio check Discover Baja's San Juanico Scorpion Bay page and local sources. Here are current conditions for the end of January 2019. 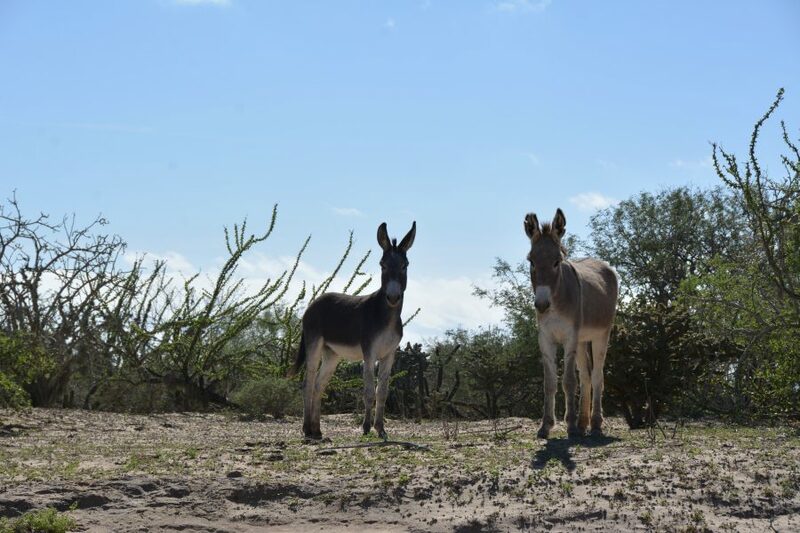 From Mulegé: Riding friends report that the route due west to San Juanico from Mulegé is really fun with a high-clearance, 4WD vehicle. I know two people who have ridden there and back in one day on their KTM 450 EXCs and another on a Can Am side-by-side. They report about seven water crossings. 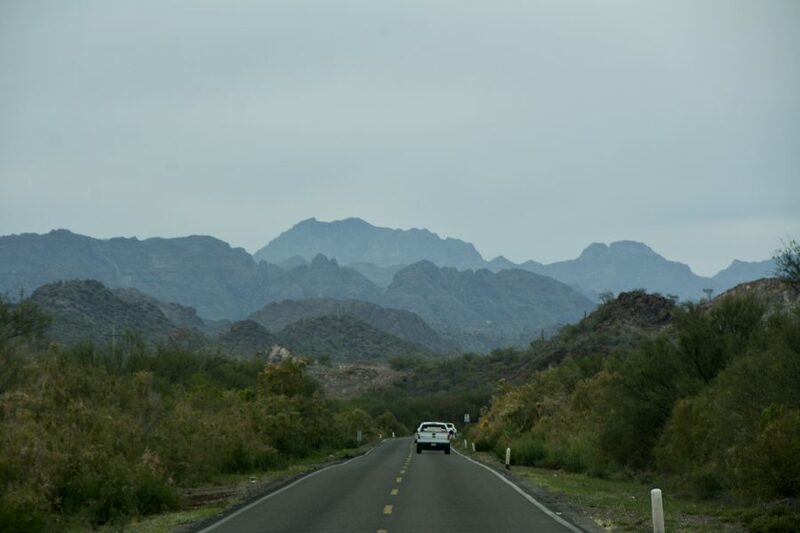 From KM 61 to La Purísima: About an hour south of Mulegé, or 30 minutes north of Loreto, turn off MEX 1 at km 61. 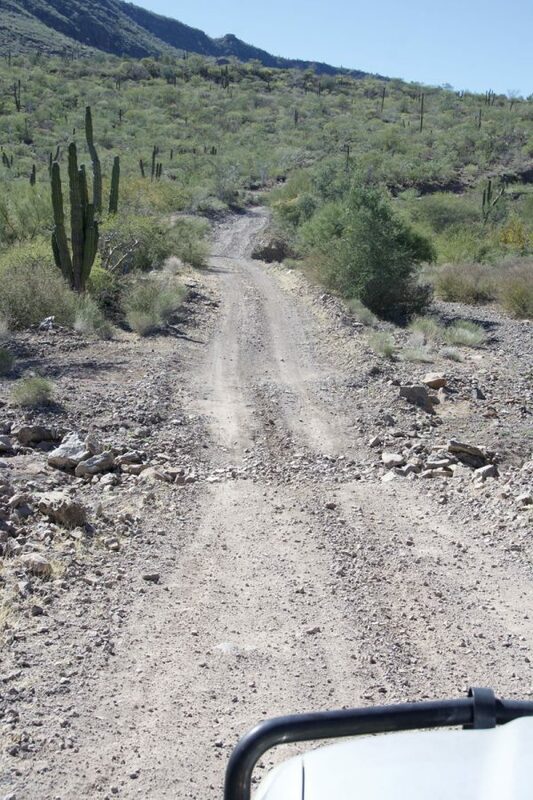 This is the easy and beautiful off-road route I describe above and is suitable for any high-clearance vehicle. It took me an hour to arrive at La Purísima but I estimate half that on a motorcycle. 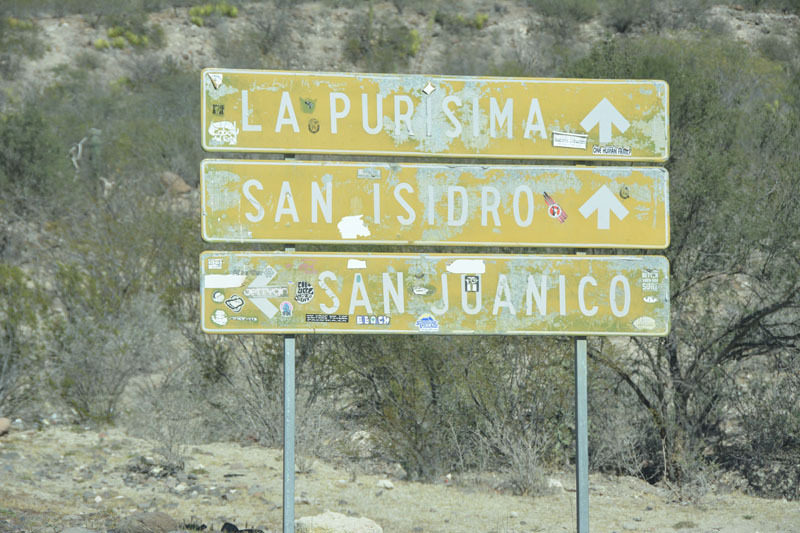 From La Purísima: There are three ways to get to San Juanico once you get to La Purísima. The highway, by heading south (not deviating from the paved road in La Purísima), then west, then north again. This takes about an hour and even a big RV can manage it. The East Road, which I chose. My trip took over two hours but I estimate half that or even less for motorcyclists. The first East Road water crossing then immediately west, which Eric's motorcycle group took, which put them onto the highway after a while. This may be a good option for big adventure bikes. Here's my annotated atlas. This atlas is way out of date and doesn't have the highway on it. Also, contours may have shifted due to washouts during the many hurricane seasons that have passed since its publication. You can download a mobile app called maps.me that keeps track of your progress even when you're offline. That would have helped me a lot during this trip. There are many other fun roads you could take from here including a loop that includes San José Comondú. chabon, Cabrito, jonz and 3 others like this. Thanks for sharing, good memories exploring that area. Good stuff, Carla! It was nice to meet you. The camp spots on the bluff are really nice. Looking at your pictures & map, I think we took the East road & both water crossings. 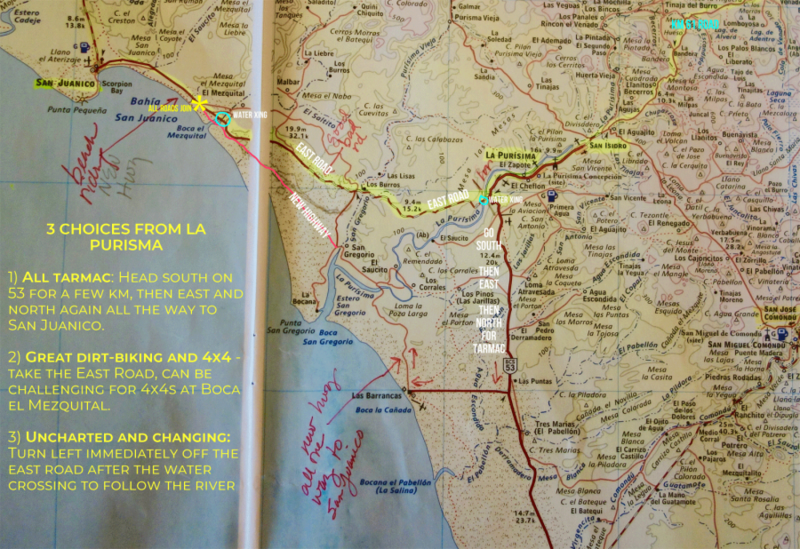 Looking at your map, I think we took the southerly road just past Los Burros, to San Gregorio. It was sandy 2 track, until it dumped us in a rocky wash, and on to the pavement. 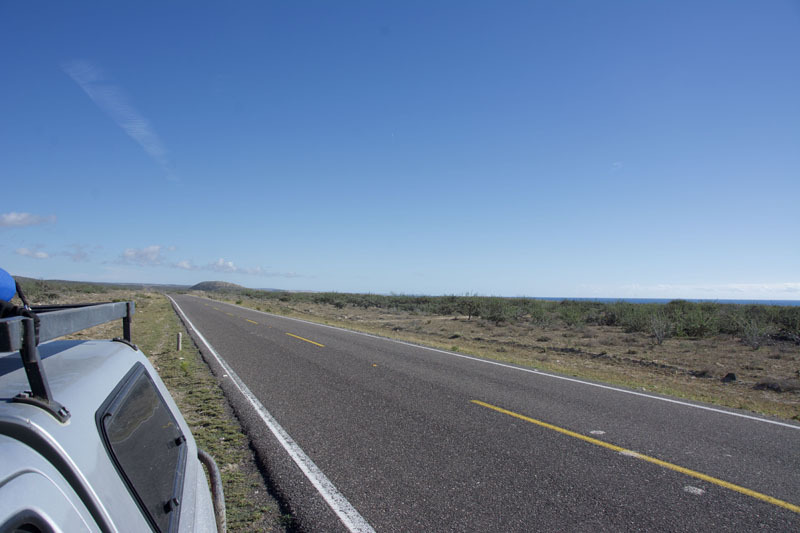 After that, the 3 other guys went looking for a way to La Bocana, in hopes of riding the beach to San Juanico. I took the highway north, and jumped on the beach at Boca el Mezquital. Fun stuff. 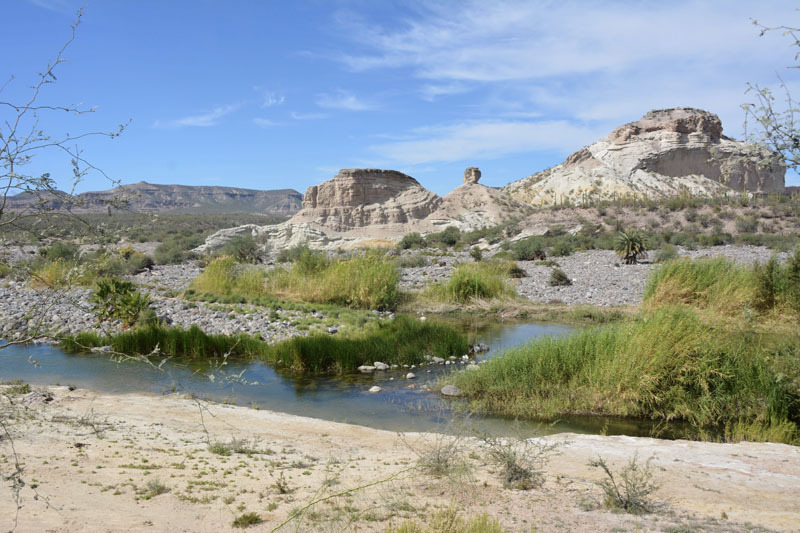 The route from Mulege to San Juanico was ridden by many in our group, and reported a great time. The road has been improved since last year, and the water crossings easy. 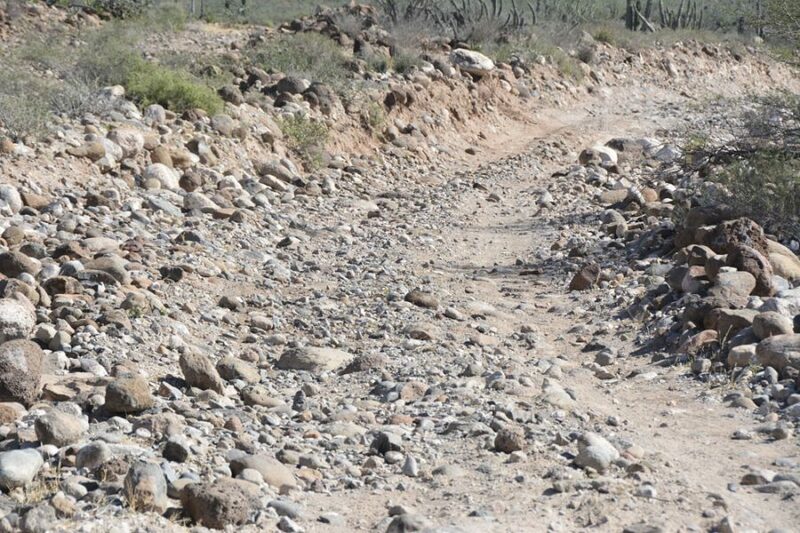 They called it the San Reymundo Wash route. Go try it. Thanks for the report. So how was the surf? Yeah, was wondering that myself. The waves weren't very big, in late January. I think summer is the best time to go there, for surfing.